I can vividly remember the first day I walked into my high school. I was very nervous, so I waited up for my best friend so we could walk into school together. The rest of that day is a blur, but I’ll never forget the mix of nerves and confidence I had walking into my homeroom. I was reminded of how difficult this transition is for students when I worked as a 9th grade teacher. I felt frustrated every day as I found myself teaching skills and having conversations that I thought already took place when my students were in middle school. Over time, I realized that the transition from middle to high school is often underestimated, with young people being sorely unprepared for a period in their lives that is instrumental in their high school and post-secondary success. Transition is hard and often taken for granted. My 9th graders thought high school was going to be a walk in the park and not much different than middle school. But the increase in work production and behavioral expectations can be quite jarring if you aren’t prepared or expecting it. Many of my students lacked the discipline and maturity to meet the expectations of their high school, so my course turned into a crash-course on how to meet the demands and successfully navigate high school. This past year as a graduate student at the Harvard Graduate School of Education, I completed my first year as a school counseling intern at a middle school. I found that many of the 6th graders I supported struggled to control their emotions, behaviors, and thoughts when in class and navigating their new school. These students often needed frequent breaks, and re-direction in the classroom. A big part of my job was to help students build the vital skills needed to succeed in middle and high school. I also facilitated group counseling sessions, which allowed students to explore their identities, hopes, fears, and misconceptions about high school. As a group, they discovered their many strengths as well as the blind spots they’d need to build up as they geared up for high school. Students painting “Identity Stones” as part of their 6th and 7th grade Girl’s Group. 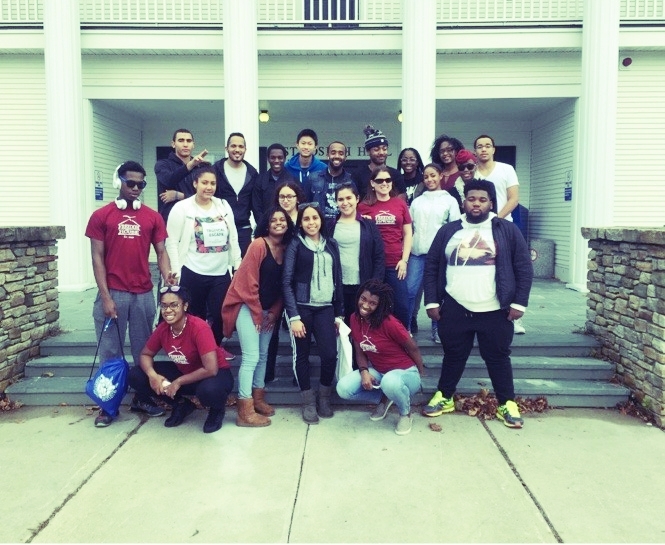 This group met twice a week and focused on identity (social, gender, ethnic, religious, etc.) and the transition from middle to high school. Get connected. Join a school club, sport, or agency that is connected to your school. Gather information. Attend your school’s orientation, if they have one. Do an information interview with a current student and ask them about their experience as a high school student. Breathe. Breathing is important, especially on your first day of school! Remember: You’re not alone. Sometimes the anxiety of doing something new feels very personal and specific to us. Know that your peers may also feel the same. Sharing and discussing as a group is a great way to help one another and trouble shoot your issues as a group. It’s also important to note that our experiences are unique. Be sure to check in with a school counselor if you’re overwhelmed with the transition. Your counselor can help support you. Be open to change and growth. High School pushes you to be your best self. We all have areas where we can grow and be better. This is where our teachers, counselors, peers, and other supportive adults come in to help us find those blind spots so we can improve and be our best. You have four years, though. There is no need to rush though the process. Overnight college visit to a school in Vermont during Spring Break. 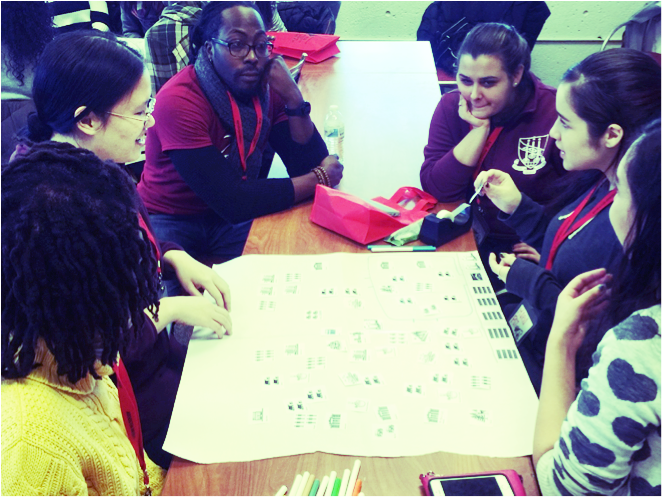 High school and college students completing a Community Asset Map with Freedom House, a college access and success nonprofit located in Boston, MA. At Freedom House, their program team’s moto is: “Teamwork makes the dream work.” Though transition happens to individuals, it is a process that is best completed as a team. None of the students I have ever supported navigated middle and high school alone. They were supported by their families, communities, teachers, counselors, and other school support staff. Most importantly, their transitions were supported by one another. Over time, my role became their role as they began to teach and held each other accountable. They reminded me that we never stop learning or transitioning. Though navigating the middle school to high school process can be scary, to successfully do so is one of the most important accomplishments of a young person’s life. These next four years will push you to grow in ways you never thought imaginable. The 9th graders that I taught all graduated from high school this year. Over 95% of those students are going to college in the Fall, with the other 5% opting to join the military or work after graduation! I remember some of these students being so distraught over their transition to high school that they thought they wouldn’t graduate, let alone go to college. And yet, as a collective team, they are all on a pathway towards success. It’s not always about how you start but how you finish. Remember that the transition to high school is but the start and does not define who you are or what you will accomplish. With a strong team around you, nothing is impossible.